Lecker! Mazzenkuchel auf noch andere Art. If you find yourself with a surfeit of matzos after Passover, or anytime really, Matzo Kugel is a great way to transform a food that is frankly richer in ritual significance than flavor into a true treat. 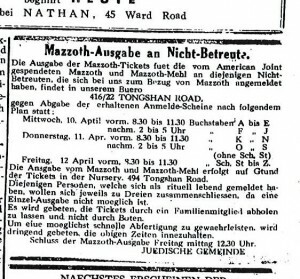 There are savory matzo kugels and sweet ones, but these three matzos from German-Jewish cookbooks are of the sweet variety. While they are all constructed around the modest unleavened cracker, each one packs a successively bigger caloric wallop thanks to the addition of fat, sugar, and, finally, alcohol. 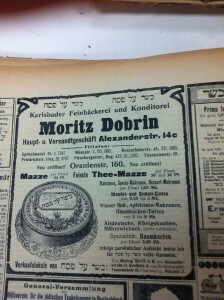 The first two are from a classic 19th century German-Jewish cookbook. 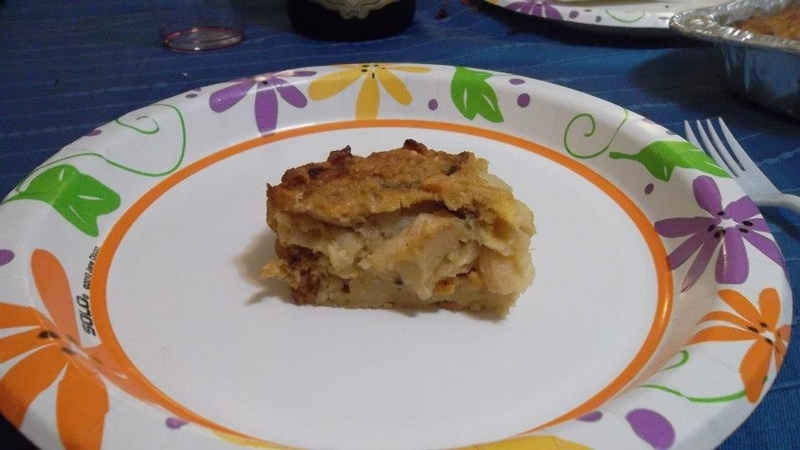 The final, more modern Kugel is a boozy concoction that will hit you like a wrecking ball. 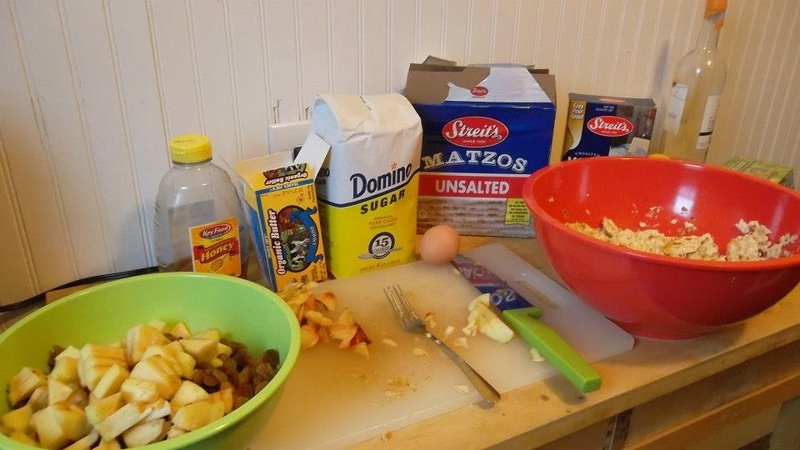 Gumprich’s cookbook lists a number of options for preparing matzo kugels for Passover. Bakers can choose from matzo kugels for the everyday table (“gewöhnlicher Tisch”) to matzo kugels for the elegant table (“feiner Tisch”). There are also options for making matzo kugels in a form or mini-matzo kugels (“Mazzenkuchelchen”). The recipe I chose was one of the simplest. Four to five matzos are dampened with wine until they are soft. They have to stay intact. Make a mixture of small and large raisins, some cinnamon, finely cut apples, sugar and a quarter pound of almonds. Wipe the pan down with fat, then lay one of the matzos in the pan, then some of the mixture, and continue in this manner until you cover the top with a matzo. Bake this in the oven for one hour. The nice thing about this recipe was that it was simple dish that could easily be put together with leftover ingredients. 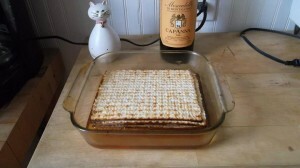 It was a little difficult to layer the matzos because once they were dampened, they started to fall apart. The resulting cake was sweet and tasty but not amazing, probably because it had no rich ingredients like butter and cream. No one disliked it, and many helped themselves to seconds. 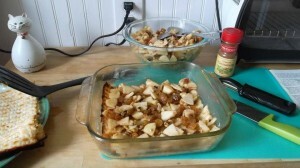 This kugel is ready for the oven! It took a while to test out my second matzo kugel recipe. Most people I tried to invite over to sample the the cake lost interest when I told them the recipe was from the 19th century. Dampen 6-8 matzos and squeeze them out really well. Add to this 8-9 eggs, a quarter pound of sugar, a quarter pound of large raisins, a half a pound of raw fat, 3 to four peeled, very small-cut apples, 2-3 soup spoons of honey, very small cut dried plums (prunes) 1 tea spoon of salt, some cinnamon, lemon, a hand full of matzo meal, and mix this all well together; heat the fat in a pot, and then put the mass in it and place it in the oven; after 2 hours pour enough water in the pot to just cover the mixture; keep the pot under steady heat until the next midday. The kugel is for 15 persons if there are 2 to 3 dishes before the kugel, and no one will be able to eat too much from it. 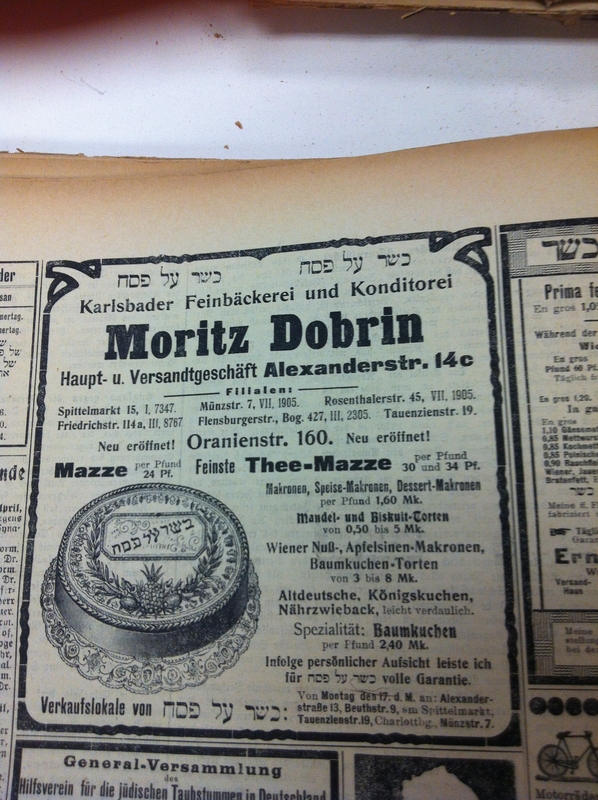 An advertisement for matzo available at several locations in Berlin. 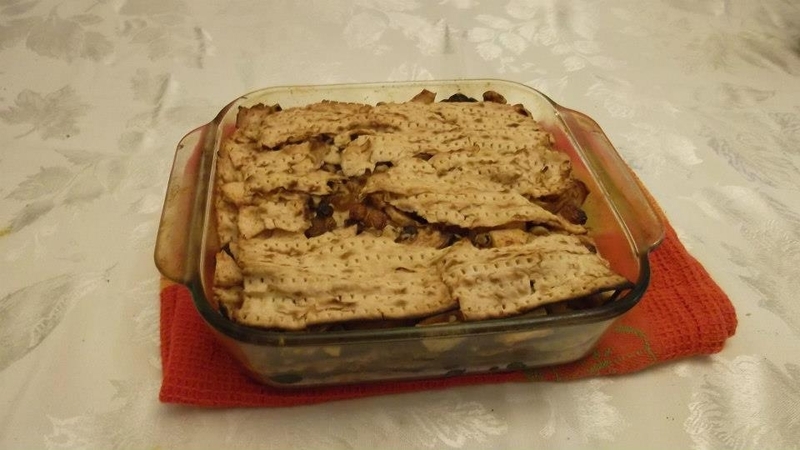 The recipe did not specify with what I was supposed to soak the matzos, so, I used wine and almond milk. Wine is common in matzo kugel recipes, but almond milk was my own addition. I also did not add “raw fat” as the recipe prescribed. I’m still not entirely sure where to find raw fat, and I just can’t wrap my head around the idea of adding animal fat to a dessert dish. I replaced the fat with butter, adding only a quarter pound instead of a half pound for the simple reason that I had forgotten to buy butter at the store. None of this bothered me much, because I’ve found that cookbooks from this era are very general with details and play fast and loose with measurements and ingredients. 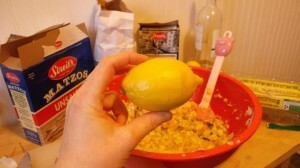 For instance, this recipe called for lemon but didn’t specify whether I should add lemon juice, lemon peel or lemon slices. It may seem obvious to most, but a novice cook like me needs specificity. I chose to add lemon juice because it seemed the most practical thing to do. 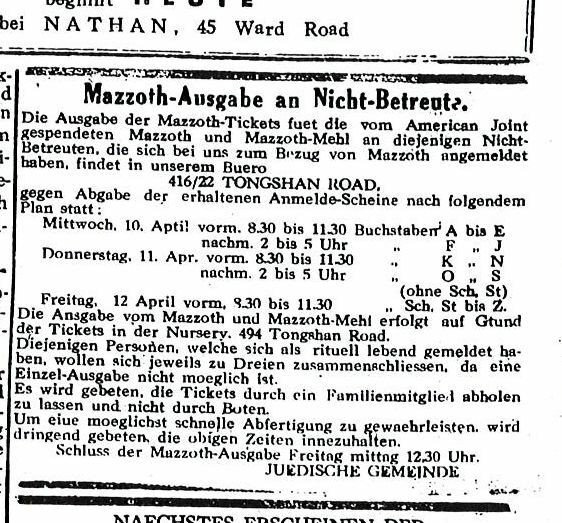 An ad regarding the distribution of matzo donated by the American Jewish Committee in a Shanghai German-Jewish Newspaper c. 1940. I drained the matzos in a sieve and pressed out most of the liquid. Despite the draining, the resulting cake was still a little damp, so I added more matzo meal than the recipe called for in order to make the kugel thicker. I also couldn’t bring myself to soak the dish in water and leave it in the oven until the next day, as called for by the directions. My guess is that in the 19th century someone was always home to keep an eye on the oven in case something caught fire. Also, cooking the dish in water probably kept it from drying out while it sat in the oven. Not wanting to risk a potential fire, I left the dish in the oven for two hours on 375 degrees Fahrenheit until it was nice and brown on top. Afterward, I turned the oven down to its lowest setting at let the dish sit in the oven until I was ready to leave to the party. 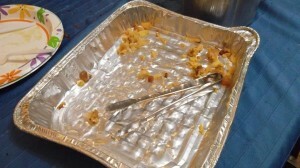 In the end, the kugel was moist and delicious; it was neither greasy nor heavy. “Fabulous!” exclaimed one guest. 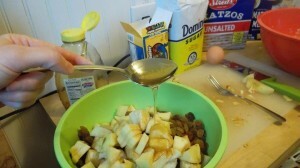 Many people asked for the recipe, but changed their minds when I listed the ingredients. “I used a stick of butter and nine eggs,” I explained. Within an hour, not a single piece of kugel remained. 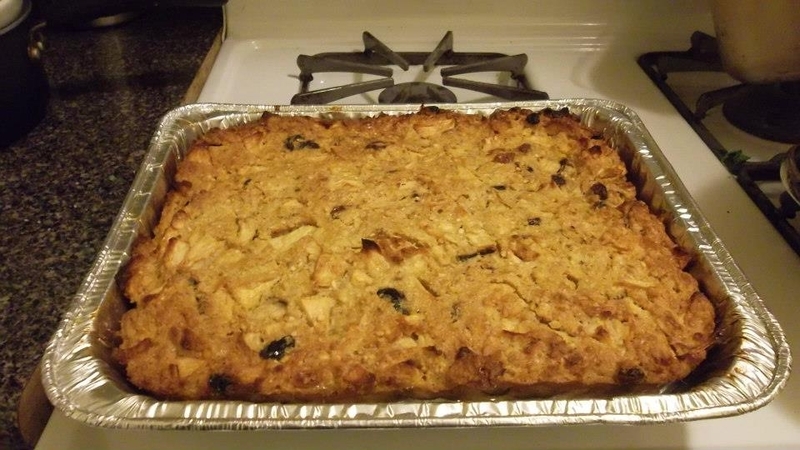 This Matzo Kugel “for the elegant table” includes large amounts of sugar, fat, and eggs. 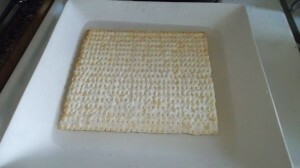 After a good soak, the matzo is strained. Lemon juice tarts things up a bit. The eggs hold things together nicely. Although the guests expressed dismay over the rich ingredients, that didn’t stop them from eating the entire kugel. 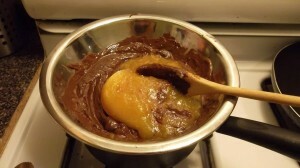 Melt chocolate and margarine in the top of a double boiler; add marmalade and eggs. Beat with a whisk till thick. Add brandy and remove from heat. Continue beating until smooth and the consistency of sour cream. 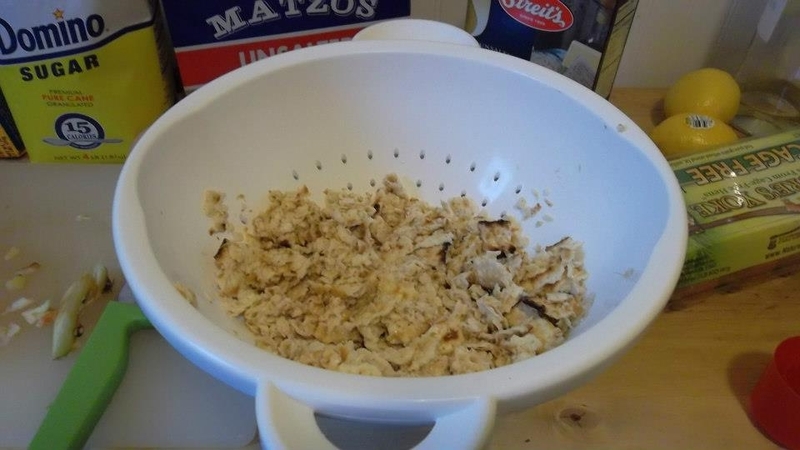 Dip matzohs in wine to moisten; do not soak. 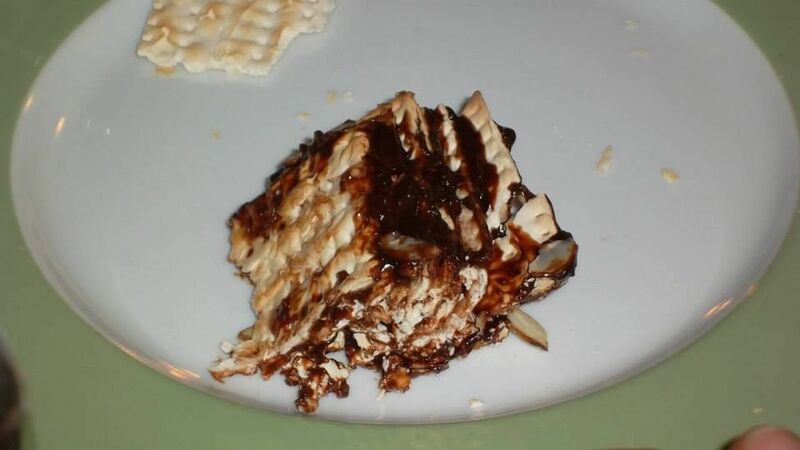 Place one matzoh on cake plate and spread with chocolate mixture; top with second matzoh, more chocolate mixture. Continue layering till all matzohs are used. Frost with remainder of chocolate mixture, and decorate with nuts. 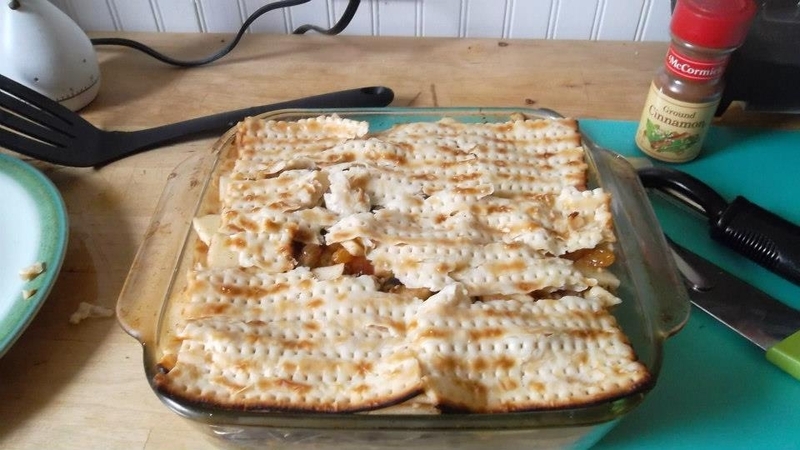 Ruth Heimann’s matzo kugel must certainly have enlivened every party. 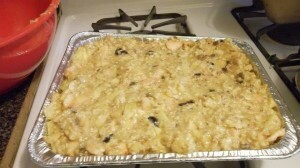 Most people who tried this dish felt a little bit of a buzz from the alcohol after having a slice, so it’s not a recommended recipe to try with children or pregnant women. 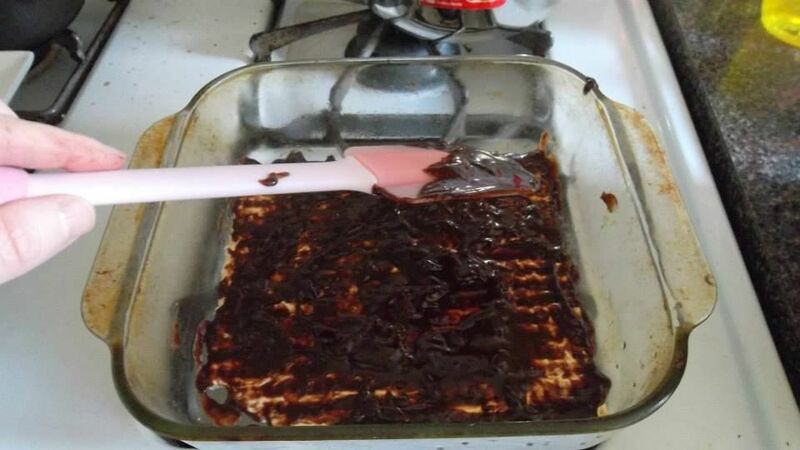 The first time I tried the recipe, I misread the directions and added the wine to the chocolate instead of simply moistening the matzos. I also tried to double the recipe to make two cakes, but ran out of matzos; so I made one cake with twice the prescribed amount of brandy, wine and chocolate. That cake had a lot of kick and made people a little tipsy. The second time I tried this recipe, I followed the directions more carefully, but I substituted butter for margarine and whisky for brandy. The kugel was a little dry because only moistening the matzos left them crunchy. 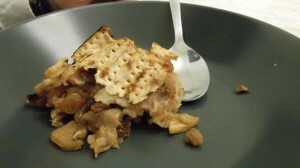 Overall it was an easy and fun recipe with which to use up leftover matzos. The taste also varied depending on the kind of marmalade, chocolate and liquor one used. Chocolate, margarine, marmalade and eggs. 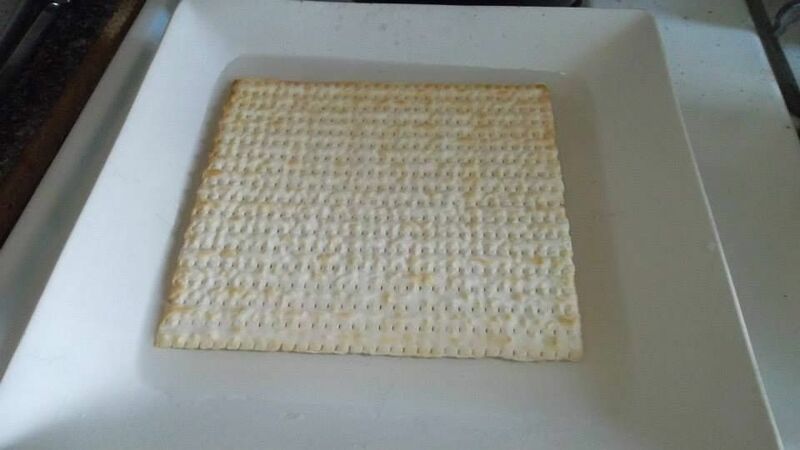 This matzo is soaking in vino. The chocolate mixture is applied to layers of matzo. This kugel is truly a party-starter.